Cross the Pennines twice, by the Huddersfield Narrow and the Rochdale Canals. 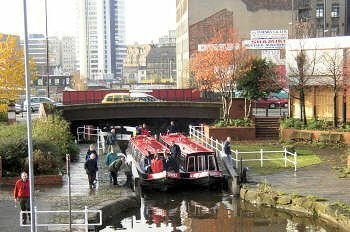 You climb to the two highest summits on the English canals, and dive through the Pennines in the longest tunnel. Friendly locals and atmospheric pubs complete this exciting journey. 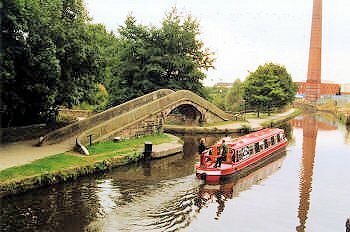 Sail down the Calder & Hebble Navigation past Brighouse, with a short river section to Cooper Bridge, where you take the right turn into the bottom lock of the Huddersfield Broad. This leads you up through the outskirts of Huddersfield right into the City centre. Go through the University, a weird but satisfying juxtaposition of sixties high-rise and nineties mill conversion, then dive under another mill (this one real) into the first of two new tunnels which lead directly into new locks. As you emerge, a steel-truss railway viaduct frames the start of your journey up the Colne valley into the hills. At Slaithwaite the canal has been put back on its original track. You will enjoy exploring the village. Then go on up the valley, to the summit, 644' 9" above sea level. Walk down to the village of Marsden, whose Mechanics Institute is the home of Mikron Theatre (though they will be away touring). The Standedge Visitor Centre gives an insight into the lives of the tunnellers who blasted their way under the Pennines, the packhorse teams who preceded them over the top, and the leggers who took the boats through 3 ¼ miles of pitch dark. The very short summit pool makes the entrance into Standedge Tunnel all the more dramatic by its understatement. Canal & River Trust will guide your boat through the tunnel, allowing you to see the work of the original miners and of their modern successors. Your guide will bring this to life. 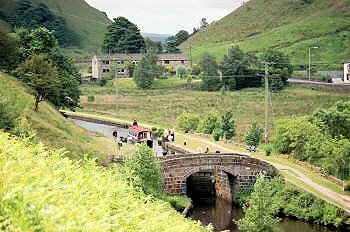 After the tunnel, the canal descends quickly through the Diggle flight, then into the Saddleworth villages, with weavers' cottages, and genuine charm as well as craft shops. The centre of Stalybridge has been transformed by the construction of a new canal. You enter Ashton by passing under an ASDA, to be compared with the Sainsbury's you passed at Huddersfield several days (and 74 locks) ago. Dukinfield Junction has perhaps the most graceful footbridge on the canals, and there is an interesting Industrial Museum opposite. The Ashton Canal takes you down, with the new tram running alongside, past the site of the Commonwealth Games and some funky new buildings, into Manchester. The city is full of life and things to do, such as the Lowry and the Bridgewater Hall. Moor in Piccadilly Village on the Ashton, or at New Islington Marina two locks up the Rochdale. Next morning, start up the part of the route with most potential for regeneration, now the canal is open: a fascinating glimpse of inner-city life. Pass under a vast interchange on the M60, and suddenly you're back in greenery. Slattocks locks take you up to a good mooring. Then it's through the canal's eponymous home town, past Clegg Hall (a Grade 1 listed restored ruin), and time for another assault on the Pennines. Take breath exploring Littleborough, or at the very least its second-hand bookshop. Pass between tall mills with the moors looming overhead, and arrive at the Summit. At the second lock down the other side, you're back in Yorkshire, and after you go under a splendidly overdone Gothic railway bridge, the Great Wall shows you are about to arrive in Todmorden: completely untouristy yet with much to enjoy - fine Victorian buildings, especially the Town Hall, a lively market and many places to eat and drink, all dominated by a curving railway viaduct. Pass down the valley, its sides closed in with crags and trees and views of the moors high above. A stream runs alongside, and the locks are set among woods or stone cottages. The Pennine Way crosses at Callis, and soon you arrive in Hebden Bridge. This old mill town nestles in a fork in the hills, houses piled tier upon tier. Hebden has excellent shops and is full of surprises - everything from horsey clothing to hand-made pottery. 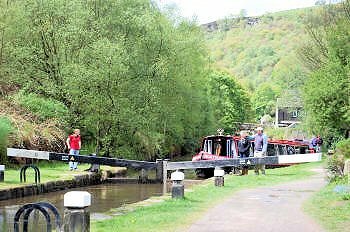 On your home stretch now, the canal gradually descends through woods, fields and small stone towns to the deepest lock in the country, which brings you finally back to our basin. This journey is recommended for experienced crews only. 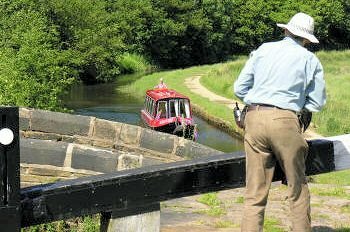 The Huddersfield and western half of the Rochdale Canals are not yet in as good condition as other canals and you may experience difficulty or delays. Passage through Standedge is available on Mondays, Wednesdays and Fridays. Dogs are allowed through the tunnel. 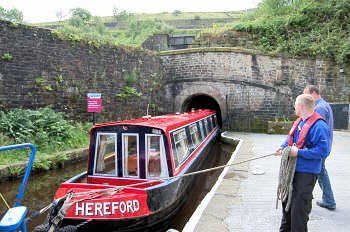 Tunnel passages can now be booked online anytime so we can do this for you once the boat is booked and the preferred tunnel direction and dates agreed. This can be altered subject to availability. We will give further details in your Information Pack. You must tell us at the time of booking that you intend to do the South Pennine Ring. We will advise on direction of travel and tunnel booking. You require an active crew; the route has many locks. At least one of the crew must have adequate experience (you need to know how to pace yourselves). All our boats can do this route as our longest ones are 56’. Two weeks is a good length of time for it and gives you time to do some side visits or be delayed. If you have less time to spare, then it can be done in a week and a half - we recommend Monday start, which gives you 11 days, rather than Friday start, with 10 days. It is physically quite demanding so needs enough crew - teenagers are good; smaller children will be able to help with the locks but not take responsibility. Choose an out and back Sowerby Bridge boat. 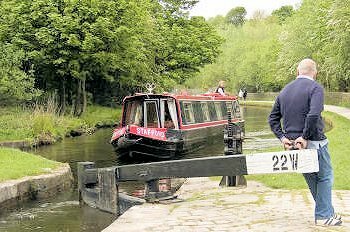 We generally suggest clockwise, and Monday or Saturday starts work best with the Marsden to Diggle passage on Friday and Wednesday respectively. If you prefer a Friday start day, then that works better anticlockwise, with Diggle to Marsden on the second Monday. We give you more details once you’ve booked and it’s good to work up both directions whichever start day you choose. With two weeks, either way round works. People who swap crews often have a preference depending on their crews’ wishes. Distances and times shown (for guidance) are for the complete ring. Information we provide about specific waterways or suggested routes is for general reference only. Please see more about route availability. "Standedge Tunnel was the highlight! Pennine scenery lovely." "The Standedge Tunnel was amazing. The scenery along all of the canals was very pretty. The Rochdale locks can be quite hard. We met loads of wonderful people and taight many children how to work a lock." 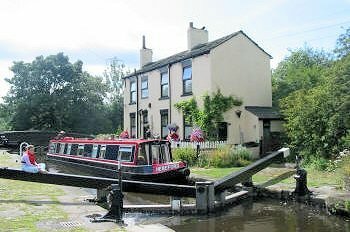 "South Pennine ring – anticlockwise , stopping at Hebden Bridge, Summit(just before), Slattocks, New Islington basin, Hyde, Woodend, Diggle(just before tunnel), between locks 32E & 31E, Milnsbridge, Aspley basin, Horbury Bridge, Stanley Ferry(having turned just before Kings Road lock), Mirfield and Sowerby Bridge.